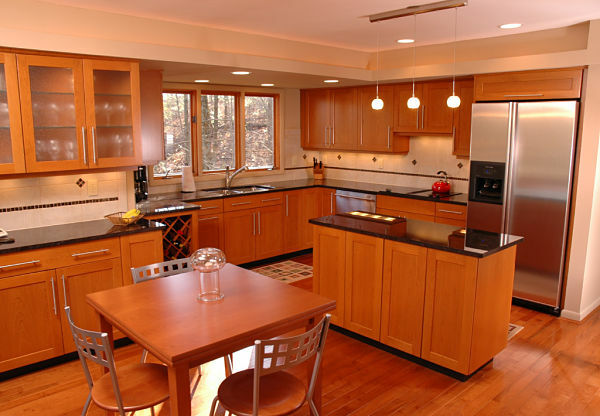 Kitchen design has two main components, layout and choice of products. We are always looking for design trends that add function and beauty to homes. We talk with manufacturers and distributors, meet with other leading remodelers from around the country, follow industry changes, and talk with homeowners in our search for the best design ideas and trends that will endure over time. This year we are seeing more of an emphasis on functional design in kitchens. Homeowners are interested in creating kitchens with optimal storage where they can easily access contents of a cabinet, cupboard or drawer. They are also interested in adequate food prep space, comfortable informal dining areas, convenient placement of appliances and strategic lighting (both task and ambient). More homeowners favor transitional kitchens that combine traditional and contemporary elements. Today’s kitchen designs have clean lines as evidenced by the continued popularity of Shaker style cabinetry, the growing interest in contemporary cabinets and farmhouse style sinks, and the use of white or neutral paint colors. Door and hall clearances of at least 34 inches. Continuous stretches of countertops for food prep. Placing upper cabinets 18 inches above the counter to allow space for coffee makers, blenders, electric teapots and other small appliance. Adequate work aisle space, 36-to-48 inches in front of appliances. Dishwashers located adjacent to a sink. Locating a sink between the stove and refrigerator for ease of food preparation. Moving a sink to a corner will create more usable counter space. Tip: if space allows, two refrigerators or a refrigerator and freezer unit can be installed together side-by-side with doors that swing left on the left hand unit and right on the right. 2. Contemporary cabinets. Sleek modern cabinetry inspired by the Prairie and Art Deco schools of architectural design is being used in more homes. These cabinets are utilitarian and easy to clean with minimal embellishment. 3. Cabinet and drawer inserts. Once optional features, roll-out shelves, carousels, pullout shelving, cabinet inserts for storing baking trays and cutting boards and drawer organizers are essential elements in today’s kitchens. 4. White painted cabinetry. The trend of white painted cabinetry endures. 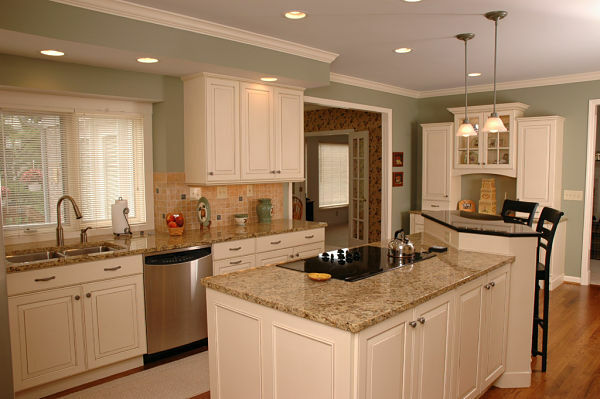 According to a national survey of kitchen and bath designers conducted by the National Kitchen and Bath Association (NKBA) assessing trends for 2013, 67% of designers favor white painted cabinets. 5. Shaker style cabinetry. The square paneled door and linear trims of Shaker cabinets work well in transitional kitchens. The Shakers began making this style of cabinets in the late 1700s and it remains one of the most popular styles in homes today because of its simplicity. 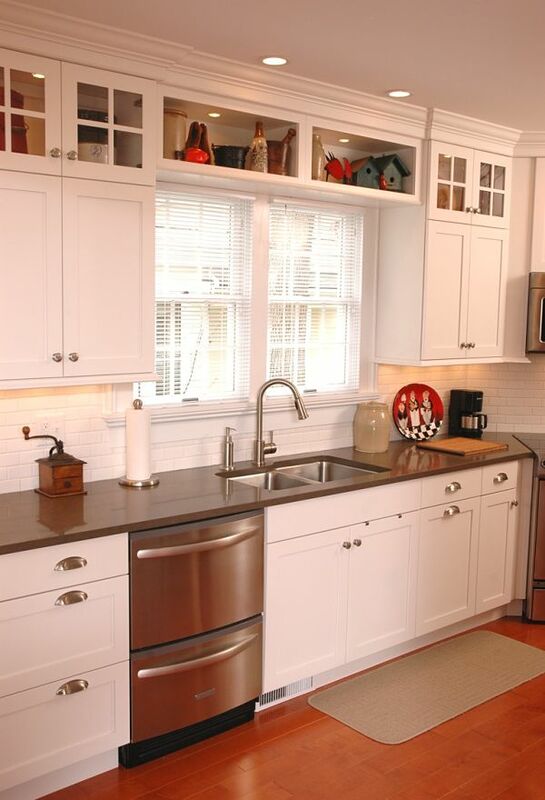 Shaker styles can be contemporary with selection of color and hardware. 6. Stained wood cabinets. Darker stained cabinets and glazes with proper lighting have been popular over the past few years. 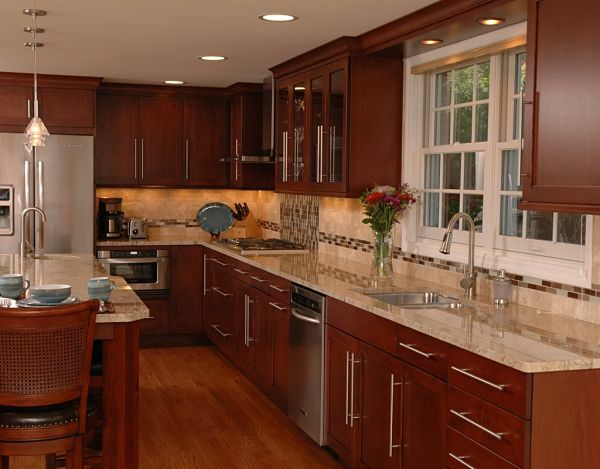 Mid-tone and natural stained cabinets, particularly Mission and Shaker style cabinetry, remain a classic. 7. Quartz and marble-look counters. Quartz counter surfaces continue to grow in popularity. New designs of quartz counters resemble Danby, Calacatta and Carrara marble and granite, which remains the number one choice of designers. Quartz is less porous than granite or marble and easy to maintain. Marble looks great with various styles of cabinetry and finishes, from white painted cabinets to espresso stained cabinets. Marble has a classic look that accentuates architectural features of a room. Quartz manufacturers realize this and have included marble patterned counters in their lines. Manufacturers of laminates have followed suit. 8. Mosaic glass backsplashes. Sixty-four percent of NKBA designers noted that they are using glass tile backsplashes in kitchens. This trend has grown steadily over the past three years. 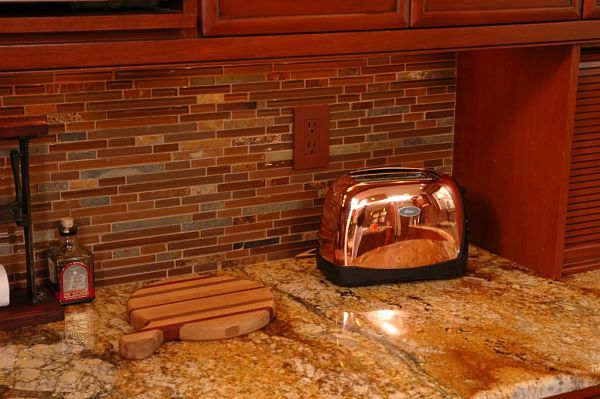 Mosaic glass tile is used as an accent or to create an entire backsplash. Its shapes and multitude of colors add interest and sparkle to a kitchen. Backsplashes can be very personal and homeowners spend more time deciding on a backsplash than anything else. 9. Polished nickel hardware. Stylish and practical nickel hardware complements many cabinet styles and wipes clean easily. It also resists tarnish and maintains its appearance over time. We also use oil rubbed bronze hardware in many kitchens. 10. Farmhouse style sinks. 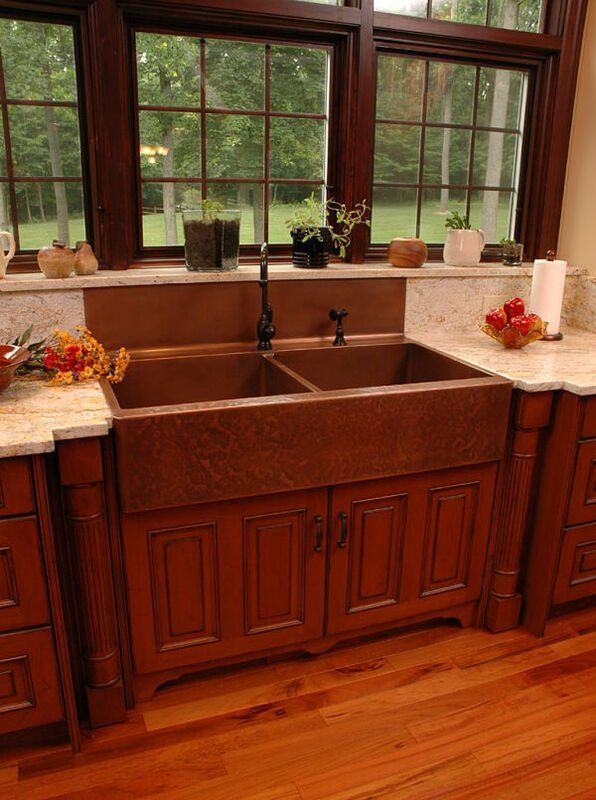 Farmhouse sinks are a prominent architectural element in a kitchen. A front apron replaces part of the counter. Style of the apron is important therefore manufacturers offer many options such as fluted aprons, curved aprons and flat aprons. They come in single and double bowls and many materials: fireclay, composite, cast iron, soapstone, copper and stainless steel. 11. LED lighting. Lighting is important in any kitchen. Since 2010 more designers are opting for energy efficient, long lasting LED lights in kitchens. The trend has increased from 51% to 77% over the course of three years as consumers have become more aware of energy efficiency. We are seeing an increased interest in LED lighting. 12. Kitchen wall colors. According to designers responding to the annual NKBA survey, 55% of designers used gray in their color schemes, an increase from 46% just two years ago. Off-whites remain the most popular at 73%, followed by beiges. 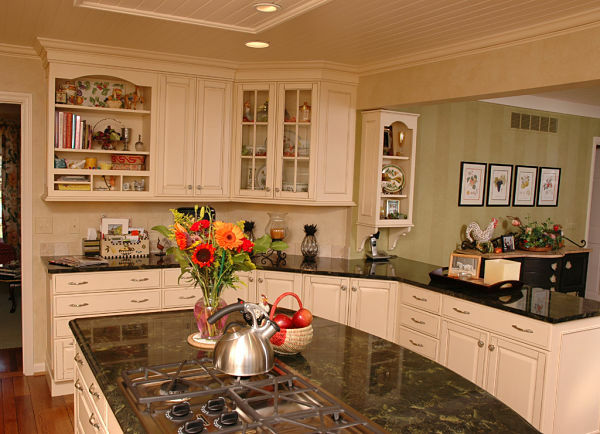 Sepia is a bold color being used by more kitchen designers, and we continue to use bolder colors. 13. Touch activated and touchless faucets. Touch activated faucets, which allow you to turn water on by just touching the exterior of the faucet, and touchless faucets, which allow you to turn water off and on with the wave of the hand, are being used in more and more kitchens. The advantage is that they limit the spread of germs when preparing food, cooking and cleaning up. 14. Soft close cabinet drawers and doors. Soft closure hinges help to preserve the life of cabinets and finishes by preventing slamming. They are also a safety feature, particularly if young children live in the household, because they prevent fingers from being caught.